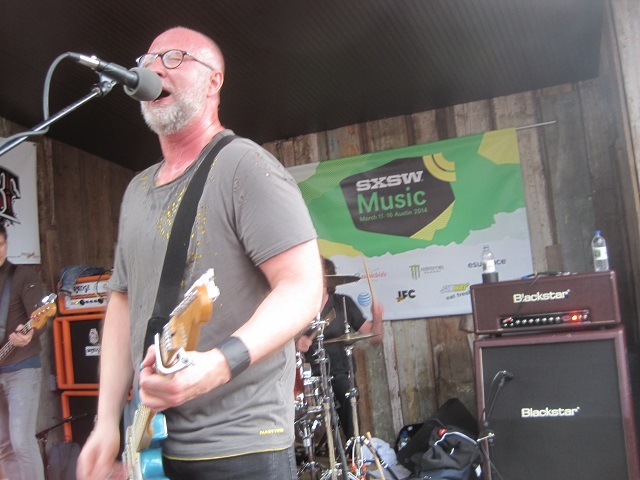 On the Friday of SXSW, I did something I don’t usually do – I parked myself in one spot for the entirety of the afternoon and stayed there, largely because I wanted to see Bob Mould, but also because one could do a lot worse than the AV Club party’s lineup, which included Sylvan Esso, Eagulls, Speedy Ortiz, and Wye Oak. Sylan Esso got things off to a solid start (for me at least – I had missed Public Service Broadcasting’s day opening slot) with their catchy electro pop. Vocalist Amealia Meath noted that she saw “a lot of babes” out in the crowd, while Nick Sanborn mentioned that “like most electronic musicians, daylight is my nemesis. I’m like a vampire. We just tan so easily.” It’s true, electronic stuff can often work better in a darkened club, but the sunny atmosphere worked well with their music and they band seemed to be having a lot of fun up there. Up next were Eagulls, who on paper I really should like more based on their noisy post-punk informed sounds, but who never really made a huge impression on me. None of the songs quite stood out for me and their performance, while energetic, just didn’t capture my attention. I will admit, though, that I did miss part of their set to grab a bit of lunch, and I do like their recently released self-titled album well enough, so maybe I’ll just chalk this one up to SXSW fatigue on my part and make a note to check them out another time. Speedy Ortiz, on the other hand, did make a good impression on me, with their songs evoking the sounds of the ’90s. Over the duration of their set, guitarist Matt Robidoux impressively managed to change two strings on his guitar, which looked like it’s been well used over the years, while the band didn’t miss a beat. Experiencing greater technical difficulties was Wye Oak, which actually comes as no huge surprise since the band’s got a lot of gear and the turnaround time at these kinds of shows is fairly quick. And although from the vantage point of the crowd it still sounded pretty good, Jenn Wassner apologized from the stage, stating that it was their “worst set ever” but also noting that she was still happy to sing her songs for us despite all the problems. Also, if this truly was their worst show ever, I now feel like I can brag that I was there. Always look on the bright side, I say. And finally, up next was Bob Mould. While Sylvan Esso’s Beath noticed a lot of “babes” in the audience earlier in the day, the crowd changed up a bit before Mould’s sets with a lot more older, bearded guys, some of whom were really enthusiastic in their appreciation of the former Husker Du/Sugar frontman. Mould and his band, which also includes Jason Narducy and Jon Wurster (who proved once again that he’s one of the best drummers out there … besides Peter Criss, obviously), seem to be the happiest band going , smiling continuously throughout their set. Considering how long they’ve all been playing and how many gigs they must have played, this is especially impressive. It’s obvious these guys have a lot of fun playing together and if the new numbers they played during their set are any indication, I’m looking forward to hearing them play more.